Last Saturday I took a train from Selhurst to Milton Keynes and started cycling back home. (At the moment you can get 15% off off-peak Southern tickets when you buy them at least 2 hours before travel, online.) I’d been thinking about doing that cycle since the Milton Keynes Mapping Party back in May last year. The first part across Milton Keynes to the Grand Union Canal, and then down to Leighton Buzzard went fairly well as the towpath is paved and some of it is part of the National Cycle Route 6. South of Leighton Buzzard however, the towpath turned to grass and for some of it mud. There were patches where it was paved nicely. There was one point the mud had got so bad I had to stop to clean the bike. Heading through Berkhamstead there were some birds that really didn’t like anyone going along their path, so had to hop off the bike and walk around them. Past the M25, and almost into Watford and I find another pile of mud in the path, so I stop to take a look at TrackMyJourney’s map viewer to see if there is an alternative route that may be better. Via the help of the OpenCycleMap (from within TMJ), I seen that there was the National Cycle Network Route 61, that hopefully would have been less muddy. About to move off and notice I had a puncture. So instead of trying to fix in the dark, with a muddy bike to hinder things, I decided the best option was to push the bike to Watford Junction station to get the train home and deal with the puncture once the mud had dried a bit, thus the mud would flake off. Also on the way to the station pushing the bike I manage to map a couple of missing street names, post boxes, benches, bike parking and found a street name that was mis typed into OSM. After the first attempt, I found that I had a slow puncture. It was another puncture elsewhere in the tube rather than the repair failing. It was a total of just shy of 40 miles, which is about half of the distance I was expecting to do. Considering that I’ve been doing very little cycling at the start of this year due to the bike being serviced from the accident at the end of last year, and the not so great weather, it’s not too bad. I suppose I’ll have to just postpone my annual maddly long first long cycle of the year until March. I also got a bunch of nice photos to add to the CycleStreets Photo Map, and test a new method that makes it faster to import photos from Flickr. This will mean that there will be photos of the route, when someone plans a journey that takes part of the route that I took. 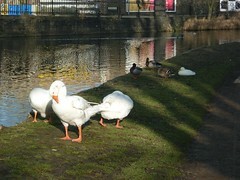 This entry was posted in Canal, Cycling, London, OpenStreetMap on March 2, 2010 by smsm1986.